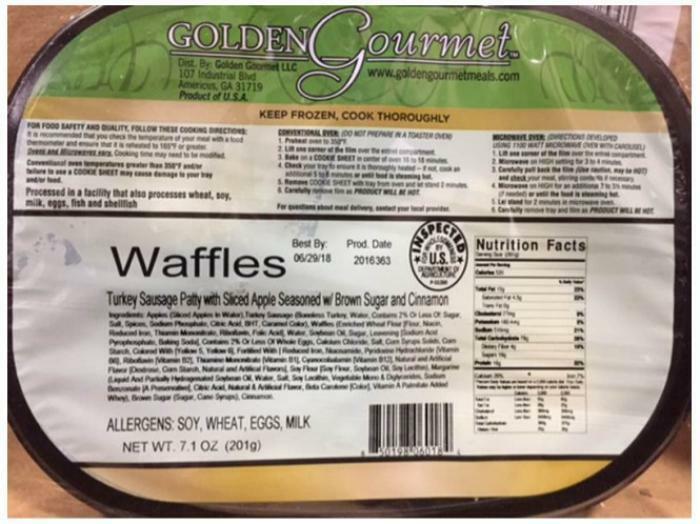 Golden Gourmet of Americus, Ga., is recalling approximately 5,248 pounds of frozen waffle and turkey sausage entrees that may be adulterated with Listeria monocytogenes. 5,248 lbs. of 7.1 oz. trays with clear film in cardboard box packages containing “Waffles, Turkey Sausage Patty with Sliced Apple Seasoned w/Brown Sugar and Cinnamon” on the label, lot codes of “2016355,” “2016363,” “2016364” and “2016362,” and Use By dates of 06/21/18, 06/28/18, 06/29/18 and 06/30/18. The recalled products, bearing establishment number “P-51269” inside the USDA mark of inspection, were shipped to institutions in Georgia, Iowa, Illinois, Ohio, South Carolina and Tennessee. Consumers with questions regarding the recall may contact Sherry Cannon at (229) 389-2392.